The centerpiece of McClain Gallery’s presentation is Dorothy Hood (1918-2000), whose work combines color field techniques with painterly abstraction. The pictorial space and visual fissures of her large-scale paintings recall a profound mind scape that echoes her early Surrealist influences from her time spent in Mexico. 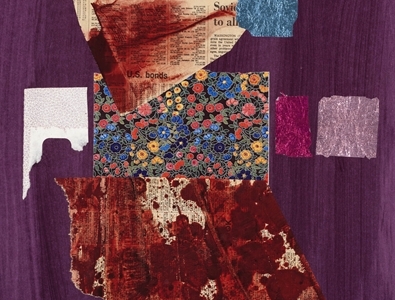 A beautiful trove of Hood collage works on paper, rich in material experimentation, reveal a more intimate look at the artist’s process and inspirations. This presentation marks the gallery’s debut showing of Hood material in partnership with the Art Museum of South Texas and its holdings and archives of the artist. Although they never met, Louise Nevelson and Dorothy Hood were contemporaries whose careers often overlapped. Both artist’s collage pieces share common sources such as Cubism, Surrealism and Pre-Columbian art as inspirations. 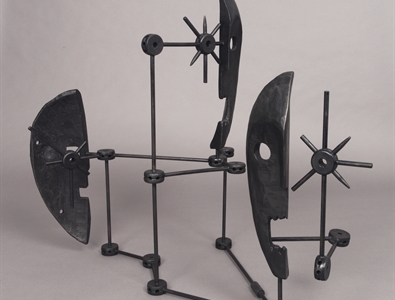 Their work was recently paired in the Museum of Fine Arts, Houston exhibition: Kindred Spirits: Louise Nevelson & Dorothy Hood, November 3, 2018–February 3, 2019. 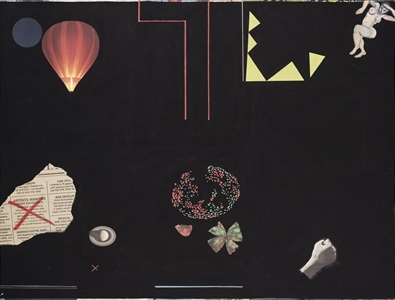 Having moved back to Houston in 1962, the impact of the space age and the fathoms of deep space were a profound influence on Hood’s paintings. The spatial expanses of the subconscious, the symbolic and even spiritual realms echo throughout the booth. In Anne Deleporte’s ongoing photo-fresco series, she paints over collaged newspaper pages, yielding a visual shorthand that highlights images rather than words. In her work, as in Dorothy’s paintings, fields that read as voids become mysterious volumes ripe for exploration, where there is as much interest in what is concealed as in what is revealed. Similarly, the sculpture and works on paper by Bo Joseph draw from a myriad of cultural references and shared histories as Hood’s collages. Joseph’s works on paper and sculptures reimagine and decontextualize the familiar into abstract forms of layered content, fragments of meaning, and open-ended touchstones. Julia Kunin has spent over ten years going to Hungary working with ceramic engineers and glaze chemists. The iridescence of her well-researched and unique eosin glazes, a type of metallic luster-like glaze, lends an otherworldly presence to her work much like the mystical spaces created in Hood's paintings.